Hullo, and welcome to yet another Happenings in Ruby, the series that takes a look around the community and says “Hi, um, what’s going on?” Â Let’s get to it. 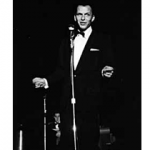 Do you use Sinatra? Are you jealous of Rails programmers and their snooty, little console? If so, you need to try Tux, which claims to be the Sinatra equivalent to rails console It looks crazy useful, allowing one to issue requests to your Sinatra app, list out routes, and configure Tux to suit your needs. 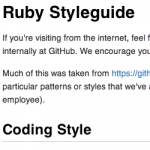 I know you have style, and you know you have style, but does your Ruby have any style? If not, this guide from the people at Github will help you out. It covers items like when to use a ternary operator, when you use parentheses, and if you should use an unless-else statement after Labor Day (or, um, ever.) Githubbers just keep giving to the community, and I can’t get enough of their love. If you haven’t picked up on this, I love Git. A lot. Git is probably uncomfortable with the magnitude of my feelings for it. Anyway, Colin Gemmell (pythonandchips on git…best…github…name…ever) has created git-presenter along with this blog post showing how to use it. The idea is that, instead of live coding during your presentation (and failing then flailing then cursing then smashing your fists on your mac bursting into tears and running from the room….maybe that’s just me) you can create commits for each stage of the presentation and move through the code commit-to-commit. Brilliant. If you’ve ever wondered if a pull request can be downright hilairous, now you know. Heelarious. I just found Queue Classic from Mr. Ryan Smith, and it looks worth standing in line for (HA! You see what I did there? Line == Queue??? Man, I am writing that one down…) I use Resque for just about EVERYTHING from sending notifcations to handling requests from my children. I also use Postgres quite a bit as well. Queue Classic offers a simple queue mechanishm build on top of Postgres. If you don’t want to add a Redis dependency, but you want something a bit more queueish than delayed job, give Queue Classic a go…I think I will. In response to an attack on Rails from another developer, Ryan Bigg wrote this response and I like it. It’s too the point, not angry, well thought out, and if you hum the “The Battle Hymn of the Republic” while you read it, it fires you up! Seriously, when people attack Ruby or Rails (or, actually, any tech that has a good following) with anger and venom, I always want to reply with the poise and a professionalism that Ryan shows in that post. Unfortunately for me, I end up stuttering and making a third-grade level insult, like calling them a booger. Thanks for being a defender of our community, Sir Ryan. I hope this Happenings in Ruby changed your life in ways that are immediately apparent. Here at Rubysource, we are about postive life-changing events based around blurbs about hyperlinks. So far, it’s working out just fine.